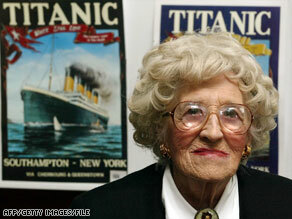 LONDON, England (CNN) -- The last living survivor of the Titanic earned only a small fraction of what auctioneers hoped to raise when she sold her final remaining mementos of the doomed ship to pay nursing home bills. Millvina Dean, 97, was trying to raise money so she can stay in the nursing home she prefers. The 17 items belonging to 97-year-old Millvina Dean sold for about $8,000 on Saturday, according to auctioneer Alan Aldridge -- not enough to pay for two months at her nursing home. Aldridge had earlier speculated the sale could raise up to $50,000 for her. But the bidder who bought the Dean item with the closest connection to the doomed voyage returned it to her after the sale, Aldridge said. "A young man bought the canvas bag for £1,500 ($2,200) and donated it back to Millvina," Aldridge said. He did not reveal the buyer's identity. The canvas bag might have been used to lift the infant Dean from a lifeboat to a rescue ship, Aldridge said. "Historical documents say she was lifted from the lifeboat onto Carpathia, the rescue ship, in a mail sack," Aldridge said. After her rescue, Dean, her mother and brother returned to England with a canvas sack, among other possessions. "There is speculation that this would have been the bag. It's a leather and canvas bag. You would easily get a child or infant in it," Aldridge said, though he added that research by the Smithsonian, the British Postal Museum and the Liverpool Maritime Museum showed no proof that Dean had been taken off the lifeboat in that particular bag. It was the second auction in less than a year at Henry Aldridge & Son for Dean, who was a 9-week-old baby when the ship sank on its maiden voyage in 1912. Aldridge said before the sale he was eager to raise as much for Dean as possible. "She's in a residential nursing home. She's 97 years of age. She's paying £3,000 a month in nursing home fees," he said. "As she said, £3,000 a month is £36,000 a year, which is a lot of money," he said. "When she runs out of money, the state will pay fees for her, but while she can pay her fees, she decides where she gets her care. When the state pays, they decide." Dean's previous sale, in October, raised just over £30,000, Aldridge said. "It's made a lot of people aware of her plight, a lot of people have sent her funds," he said. Dean never married and had no children. "There are cousins but there is no one directly to support her," Aldridge said. "The property she lived in (before she moved to the nursing home) was not hers. She's just an ordinary little old lady. "If she's lucky, she'll get another four or five years, she's quite a fit lady," he said. Dean was not available to speak to CNN herself because of a throat infection, Aldridge said. The auction included 17 items from her collection -- most of them memorabilia related to the Titanic and signed by her, but not from the ship itself. The auction, in Devizes, southwest England, also included letters from the estate of Titanic survivor Barbara Dainton-West which fetched more than $36,000. One letter sold for about $21,800, while two others went for about $5,800 and just over $10,000, Aldridge said. The letters include descriptions of her family's trip to board the Titanic and the immediate aftermath of the sinking. Dainton-West, who was 10 months old when the ship went down, died in October 2007, the auctioneer said.